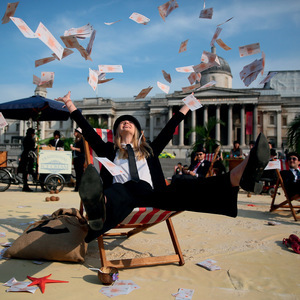 Mimicking the global super-rich at an anti-tax-haven demo in Trafalgar Square during May’s Global Anti-Corruption Summit. August this year saw one of few precious victories in the fight against the offshore economy. A European Union special commission ruled that Apple Inc has been paying an illegally low level of tax to the government of Ireland for the past 25 years, and must reimburse the state to the tune of €13 billion ($14 billion) plus interest.1 With its leaders actively trying to purge the island’s reputation as a corporate tax haven, taking the money should be a no-brainer. However, Noonan’s broader point is not so easily dismissed. In the short run, small countries with fragile economies do stand to gain from attracting foreign investment through low tax rates. If their governments were to unilaterally raise taxes on capital, so much might leave the country that overall tax revenues could actually decline. So it is of little surprise that rates of taxation on corporate profits – and private wealth – have dropped steadily over the past half-century as it becomes progressively easier to move money across borders. In the 35 countries in the Organization for Economic Co-operation and Development (OECD), for instance, corporate tax has fallen dramatically, from an average of 30 per cent in 2000 to 23 per cent today.6 (In the early 1980s rates hovered around 50 per cent.) Transnationals benefit and our governments are poorer and more indebted. While there is a growing push to hold tax dodgers accountable, this has met with stiff resistance from entrenched interests. The resulting stalemate is precisely why existing attempts to regulate tax havens have failed. At best, the end results have been half-baked policies that rely on voluntary or on-request information sharing, rather than mandatory compliance. Second, future policies must establish stronger control over capital – in particular its geographical mobility. Whereas transparency is particularly vital for combating tax evasion by private individuals, capital control is more important for combating tax avoidance by corporations. By raising the cost of moving capital around the world it becomes easier to levy taxes on it. Another unilateral option is capital controls – common in the post-World War Two period when regulators imposed a tax or a cap on the flow of capital across international borders. Given that international regulatory institutions remain weak, unilateral options appear to be a good place to start. But they also have major logistical failings that allow wealth to continue slipping off the radar. Capital controls have real potential, but they are more effective when implemented within a co-operative framework. A complete solution to the problem must then be constructed, dauntingly, at the global level. The proposals brought forward in the past three years by French economists Thomas Piketty and Gabriel Zucman seem to check all these boxes, although they are not easily accomplished. Piketty has proposed the idea of a global tax on capital, a policy requiring all countries to co-operatively ‘establish a tax schedule applicable to all wealth around the world and then decide how to apportion the revenues’.9 In theory, this policy would diminish or even destroy the opportunities for Apple-style tax avoidance schemes. Zucman proposes that the international community establish a global financial register which would record the ownership of all financial assets and enable governments to tax effectively their own citizens’ wealth. There is no doubt that Piketty and Zucman’s policies would go a long way toward eliminating the problem of tax havens and perhaps even tax evasion in general. The problem is that obtaining this level of international co-operation is extremely difficult. At the moment, the only two institutions with a truly global purview are not well positioned to enforce this kind of policy. The United Nations, on the one hand, has a fairly progressive track record, but has never had a strong stake in economic policy and lacks regulatory muscle. The World Trade Organization, on the other, is far more interested in protecting capitalists’ interests than the public’s. If such proposals are to be realized, these organizations will have to be either radically transformed, or some entirely new institution will need to be created. A comprehensive solution is ambitious. It must be both simple enough for easy multilateral implementation and comprehensive enough to ensure that money does not slip through the cracks between different regulatory bodies. Whether we can construct such a system depends on governments having the political stomach for it. That depends on the amount of pressure their citizens, weary of revenue-starved austerity, can bring to bear. Niko Block is a Toronto-based writer and activist.